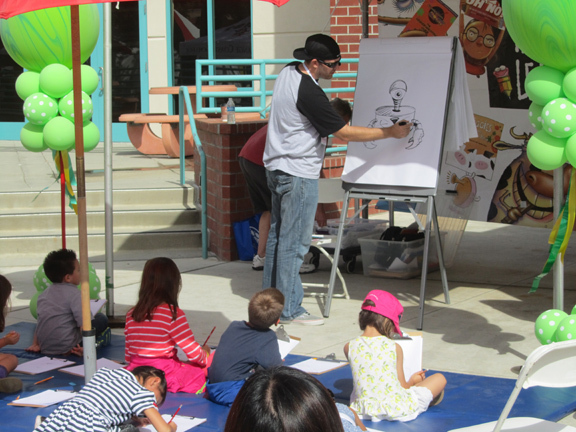 studio pictor - David on the illustrator stage during the Orange county book festival. David on the illustrator stage during the Orange county book festival. ﻿ Southwest desert native, David Lizanetz, is an award winning and published artist. In 2000, he earned his Bachelor’s Degree in Fine Art from Arizona State University. Since then, he’s worked with art production companies, publishers and galleries all over the United States. ﻿David works with many different mediums and art styles. In 2002, David started his own art company, and then branched out in 2011 by creating Sour Apple Gallery--his own retail store and contemporary gallery/studio. David currently shares his books and artwork at local libraries, book festivals and pop-culture conventions. David still creates artwork everyday and currently writes and illustrates books about his original creation: The CANimated Critters, along with a brand new adventure series coming soon!